Stross is the proverbial mastermind behind ANC’s proprietary vCOMM software platform. vCOMM was developed specifically for the retail, transportation and commercial markets, utilizing many of the features from ANC’s live-event platform including precise frame synchronization across multiple servers. 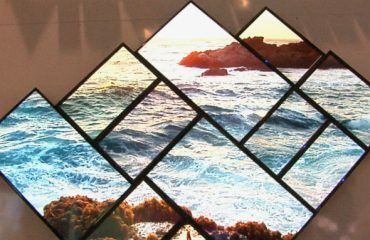 In addition to the black LED package, the 10,000-pixels deliver the highest resolutions available across all 19 digital screens. But the number-one asset here, according to Stross, is his software’s capacity for incredible scalability and the unparalleled ability to dissolve from one image to another. 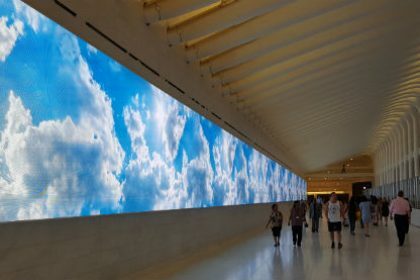 Thanks again to ANC’s vCOMM operating system, The Westfield World Trade Center will combine with the 53 digital signage sites at Fulton Center and are capable of syncing up thereby connecting Lower Manhattan on a level most citizens in any metropolitan city probably never dreamt about.